Congratulations on an excellent shot!! Very nice focus of the eye with bright colors. Good Composition. Good Job. You seemed to catch his interest! 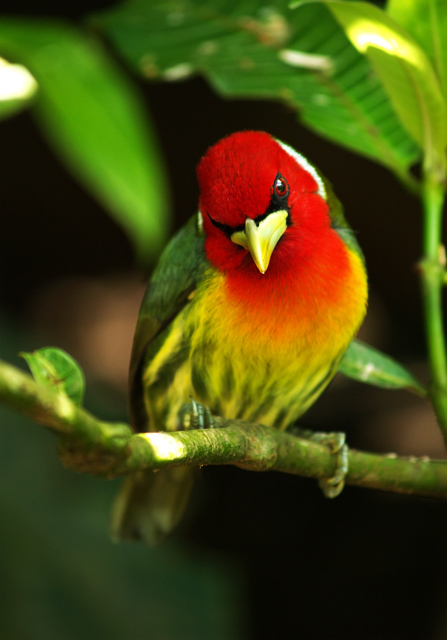 What a beautifu, colourful bird, I just love the vibrant colours of the entire photo. Wow, that's rich color. Shame about the couple of blown spots which detract a little. Be nice to see the bird more centered or else more 'extreme thirds', if you had interest in the rest of the image. I'd like to see more detail, so I think perhaps center - but your call of course. Nice color combination and background. Another great capture, but not not totally sharp and popping crisp. Everything else, colors, contrast, composition are nice. Wonderful setting and an excellent pose from your subject. Shy and coy at the same time! He looks to be eying me with suspicion. Good dof, and color contrast. Nice focus, and I like the shallow DOF. Proudly hosted by Sargasso Networks. Current Server Time: 04/23/2019 08:23:25 AM EDT.